Soot, creosote, debris in your chimney? We’ll get it all out. And that’s important for fire safety. 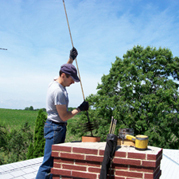 Our CSIA Certified Chimney Sweeps inspect and sweep chimneys of all kinds, including oil-, wood-, and gas-burning chimneys. Ever notice a nasty smell from your fireplace in the heat of summer? That could be creosote deposits, which are a byproduct of burning wood. A lock-top can stop that and save energy. The National Fire Protection Association Standard 211 says, “Chimneys, fireplaces, and vents shall be inspected at least once a year for soundness, freedom from deposits, and correct clearances. Cleaning, maintenance, and repairs shall be done if necessary.” This is the national safety standard and is the correct way to approach the problem. It takes into account the fact that even if you don’t use your chimney much, animals may build nests in the flue or there may be other types of deterioration that could make the chimney unsafe to use. The Chimney Safety Institute of America recommends that open masonry fireplaces should be swept at 1/8″ of sooty buildup, and sooner if there is any glaze present in the system. This is considered to be enough fuel buildup to cause a chimney fire capable of damaging the chimney or spreading to the home. When sweeping your system, we ensure that it’s in working order. We look for any problems that could prevent peak performance and recommend what is needed for your system to burn cleanly and safely. We are dedicated to becoming your Sweep for life. We pride our selves on providing the kind of service and expertise that you have become accustomed to from our company. We will treat your home as if it were our own and we use the best dust vacuum in the industry to assure that your home remains clean. Guaranteed!